News update - December 2013 - new bird hides and information boards have been installed in the Nature Reserve during the year. There are many wild and interesting places to visit in the Algarve, but this is my favourite nature reserve in the region. Although Parque Natural da Ria Formosa Centre is not signed from any direction and is difficult and frustrating to find, this important wildlife site (it is designated under the RAMSAR convention as a wetlands reserve of worldwide signficance) is very well worth a visit. It took us four attempts on separate visits to the Algarve to finally find it, and as we were travelling from the mid-Algarve by car, our wandering cannot be described as an environmentally-friendly activity, but it was worth the effort. We hope that the directions below will help other visitors to find and enjoy this lovely place, its wildlife, wildflowers and fungi, without having a nervous breakdown on the way! From the A22, turn off at the Olhao junction (Junction 14) and proceed south for approx 8km towards Olhao. Upon reaching the roundabout on the N125 at Olhao, turn right and drive approx 400m towards Olhao Centre and then turn left down Avenida Parque Natural da Ria Formosa. (There is a petrol station on that junction.) Proceed past a campsite and over a railway track, and about 1km further on the entrance to the Parque Natural is through large, double gates on the left. This is an ideal place for families to visit. The paths throughout the reserve have hard surfaces which can easily accommodate prams and also wheelchairs if there is a disabled person in the party. There is a good boardwalk across part of the salt marsh, which is also accessible to wheelchairs and prams and gives an excellent view of many of the plants that are unique to this hostile environment. In the main Visitor Centre building there are a drinks machine and public toilets. There are information boards throughout the reserve, and leaflets about the wildlife of the area (not all of them are specific to the reserve) are available at the main gate. There are also bird hides in the reserve (new ones built in 2013) and plenty of good vantage points from which it is possible to observe the bird life. This 18,400 hectare site extends from Anção, near Almancil, eastwards as far as Vila Real de Santo Antonio – covering some 60 kilometres of the eastern Algarve Coast. Running opposite and parallel to the coastal edge of the reserve is the barrier island system of Ria Formosa, which protects a warm-water lagoon with its mosaic of salt marshes, islets and tidal mud flats. This unique environment harbours many resident and migratory birds and offers shelter to other threatened species of fish, plants and animals. 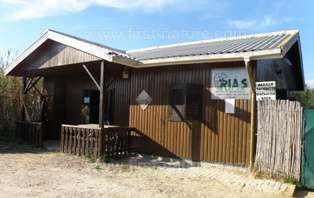 Parque Natural da Ria Formosa is also home to RIAS, a privately funded animal hospital. This wildlife rehabilitation centre has been in existence for more than 20 years and manages the care and treatment of injured and sick wild animals with a view to returning them to full health and their eventual release back into the wild. Its facilities are meagre; a small reception area, an operating ‘theatre’, a room full of cages for the really sick that require solitude or constant attention, a store room or two and then, outside, several enormous aviaries housing the largest raptors. The centre is open all year round and the staff welcome visitors to the information display area, but please note that RIAS is not a zoo and the sick animals cannot be 'visited'. Many are recovering from life-threatening injuries and require absolute peace and quiet. The Park is a major stop-over point in the bird migration routes between Europe and Africa, and is a wintering ground for birds from northern and central Europe. Several duck species such as Wigeon, Anas penelope, Teal, Anas crecca, Shoveler, Anas clypeata, and Pochard, Aythya ferina, can be found here; and waders including Dunlin, Calidris alpina, Curlew, Numenius arquata, Bar-tailed Godwit, Limosa lapponica and Grey Plover, Pluvialis squatarola, are also present in winter. 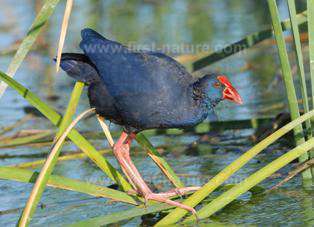 The Ludo Quinta do Lago area is the only confirmed breeding ground of the Purple Gallinule, Porphyrio porphyri, and hence this bird is used as the symbol of Parque Natural da Ria Formosa. The indigenous plants fall into two categories: those found in salt-marsh habitat, and those that are mainly associated with sand dune systems. Without question, the salt-marsh ‘star attractions’ are the excellent displays of Cistanche Phelypaea – a member of the Orobanchaceae (Broomrape) family. 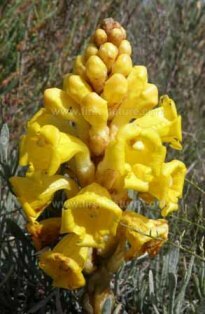 These fascinating, parasitic plants with their bright yellow flowers are found only in southern Portugal and southern Spain, on Crete, and in a few parts of the extreme eastern Mediterranean. Cistanche phelypaea is parasitic on woody members of the Chenopodiacea family, of which the glassworts are particularly well represented at Ria Formosa. Also present in the salt-marsh is a Sea Lavender, Limonium algarvense, which is endemic to this region of Portugal. Further back from the sea, in the drier areas, can be found bindweeds, Sea Daffodil, Pancratium maritimum, Thrift, Armeria pungens, and the intense blue flowers of Shrubby Pimpernel, Anagallis monelli. In the spring there are lovely displays of Grape Hyacinth, Yellow Hoop-petticoat Daffodil, Narcissus bulbocodium and Scilla monophyllos, while both the Mirror Orchid, Ophrys speculum, and Bumblebee Orchid, Ophrys bombyliflora, can be found in good numbers, especially the latter which is able to reproduce vegetatively and therefore forms large colonies. There is also a large area of open pine woodland in the reserve, and it is in here that the elusive and beautiful Fritillaria lusitanica flowers in late February and March. Both in spring and autumn the pine woodland, with its deep layer of pine needles beneath the trees, is home to numerous fungi including pezizoid species that hug the edges of the woodland paths. 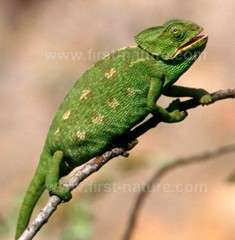 Last, but not least, Ria Formosa is one of the few strongholds of the European Chameleon. This shy creature, which lives in bushes, is seldom seen; however, each September the females descend to the ground in order to deposit their eggs. Apart from the truly outstanding opportunity that Parque Natural da Ria Formosa offers for seeing wildlife, there is also a restored tidal mill, some Roman remains, and a museum housed within the main Visitor Centre building where there are drinks machines and public toilets. A very good boardwalk runs across a large part of the reserve which, together with the level paths, makes most of the site accessible to wheelchairs and prams. The organisation responsible for nature conservation and biodiversity policy in the Algarve is the Instituto da Conservacao dat Natureza e da Biodiversidade, which is responsible for managing the Algarve's natural areas including the natural parks and nature reserves.